We love it when we have a bride send through a whole suite of photos from their wedding, it's pretty much an opportunity for us to gush over dresses, hair and makeup and most importantly (in our unbiased opinion, of course) how our florals and botanical styling influenced the over-all look and feel of the wedding! Our incredibly stylish bride, Kym sent through photos of her wedding as captured by the very talented and divine Carly Brown Photography! After all our dealings with Kym and learning what her tastes are, we're not even surprised that her wedding ended up as the epitome of understated elegance. Kym & Dane's wedding was even featured by Brydie Shephard on The Lane! Kym's brief for her wedding to Dane invoked thoughts and words along the lines of exquisite, refined, pure, delicate and elegant. 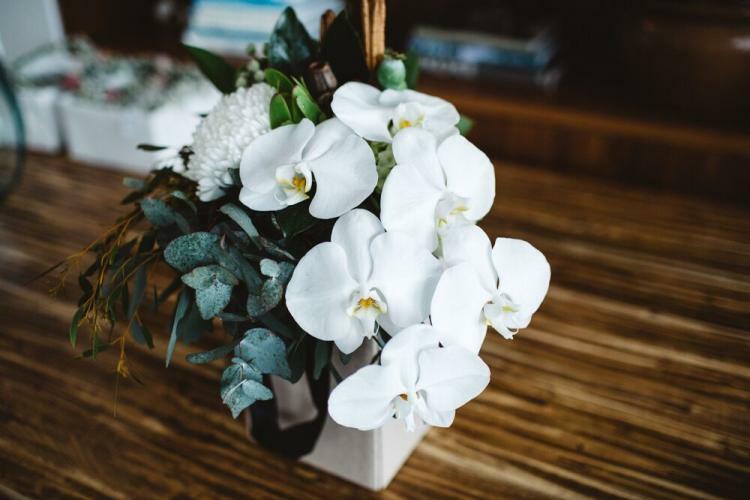 When you're given a brief such as this, we immediately begin dreaming about natural colours and native botanicals with Kym requesting her hero flower be a delicate, crisp, white orchid! How unique and interesting is that? What a combination! Who needs bridesmaid bouquets when they can wear a crown instead? The opportunity to work with Baby's Breath is few and far between these days and when combined with all the other elegant botanicals used in Kym's wedding, it was a classic and pure contrast to the bouquet and arbour. These flower crowns were simple, yet refined and allowed the Grecian tones of the bridesmaids' dresses to really shine through. Again, this was another ingenious direction on Kym's part. This woman (and her bridesmaids) have got some serious style! We have access to the most amazing botanical chandelier structure and anytime we're asked to decorate it, we know that wedding guests are going to be blown away by its presence. How many times in your guests' lives will they get a chance to be immersed in botanical heaven like this? The arbour, the chandelier and the table arrangements all take their direction from Kym's bouquet and bring continuity to the botanicals throughout the entire wedding and reception. 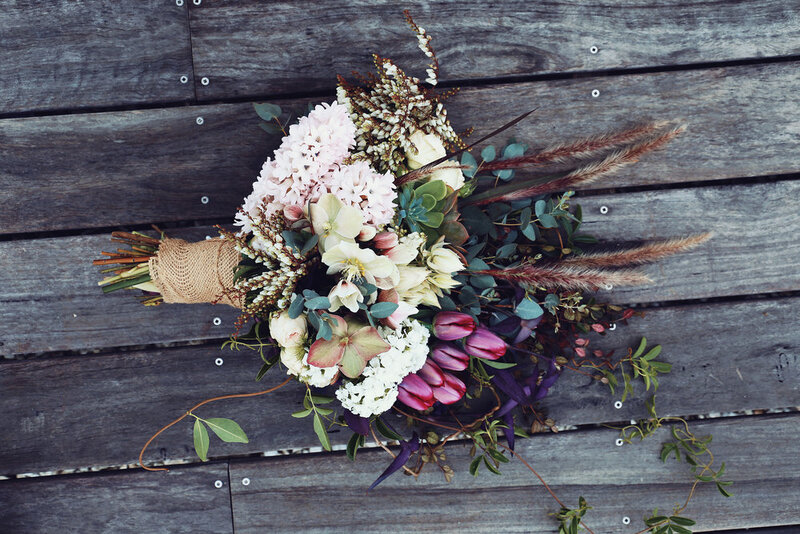 Join Beautiflora for this divinely beautiful 'Bouquet Making Workshop'! To celebrate Autumn, we invite you to come and play, with a stunning array of colour tones, natural textures and all things perfectly botanical! 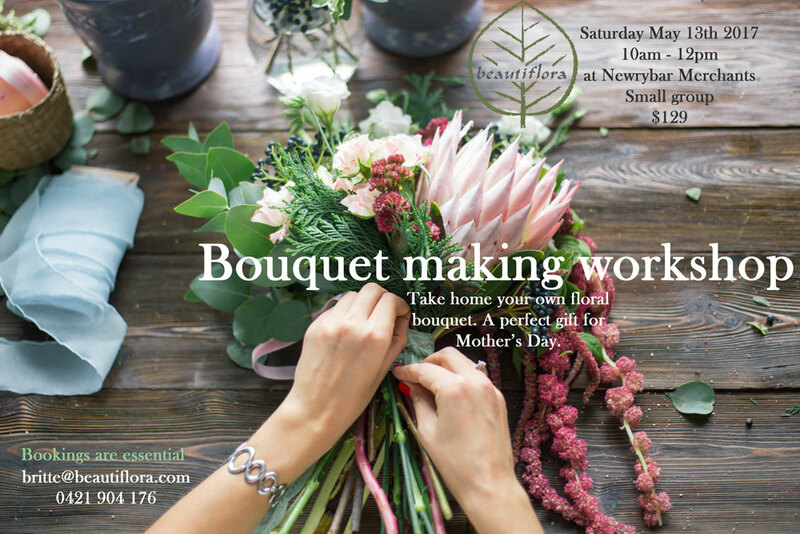 On Mothers Day weekend, amongst the loveliness in the garden @newrybarmerchants -we will be sharing our floristry secrets on bouquet making plus the basics on all things floral. Includes a delicious morning tea Newrybar style. You will take home your very own handmade luscious bouquet. You can either adore your creation at home or gift it on the Sunday. Alternatively bring Mama-bear along as your Mothers Day gesture of love. How gorgeous! Spaces are very limited so book soon to secure your spot. We are so excited that this wedding is now up on the Hello May blog! What more could two lovers want when you have a gorgeous venue, a celebrant and all your loved ones in the one place at the one time? Flowers, of course! 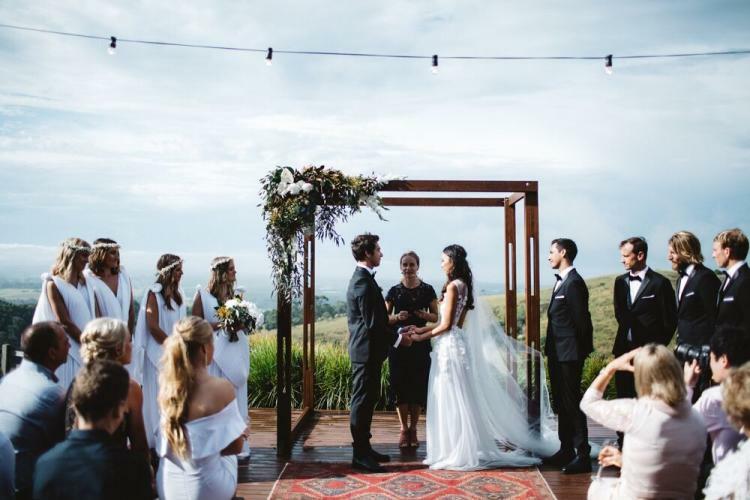 Annabelle and Sam said 'I do' in a spectacular setting known as 'The Grove' in the Byron Bay hinterland, just up the road from our florist at Newrybar Merchants. The Grove doesn't need much to help it shine - it's a stunning property with row after row of macadamia trees and large, green, rolling hills surrounding it. What a gorgeous backdrop upon which to get married! Annabelle's brief included not only a wedding party of eight people, but a huge arbour, petals for throwing, table settings, two incredibly large botanical rings suspended from the roof of the sperry tent and an all green leaves & mossed-up the totem pole on the dance floor. Annabelle and Sam's guests were treated to nothing short of wondrous spectacle! We send a special thank you to Byron Bay photographer Carly Tia for allowing us to use these photos, you captured this wedding beautifully! The rustic, yet green setting of The Grove was beautifully off-set by the white, green and rust tones of the botanicals used in Annabelle's and her gorgeous bridesmaids' bouquets. Our talented florists carefully wove together a combination of florals including white ping pong chrysanthemums, gumnuts, berzellia berries, star of bethlehem flowers (at varying stages of opening), muted grey native gum and bronze and rainforest green magnolia - all set against a base of deep green mini monstera leaves. The result? A well thought-out and put together bouquet with just enough sporadic sprigs of gum to give it an unaffected, not-so-put-together garden fresh feel. The arbour was a humungous, strong, wooden structure which needed some botanicals to help soften it into the setting... In keeping with the bouquets, we toiled away up high ladders using magnolia leaves, chrysanthemums, gum and min monstera leaves to weave our magic. Who wouldn't want an arbour of this magnitude, and dressed as it was, under which to get married? Yes, please! How can we describe this botanical wonderland? Giant, white king proteas, deep green and copper-brown magnolia leaves, crisp, white chrysanthemum, sprigs of native gum, clustars of ferns, waterfalls of tropical orchids and huge agave succulents. All suspended on a ring that was able to sit at just the right height, being on an adjustable rope system we were able to get it just the right distance from the roof. With the lovely North Coast Events guys (oh that's my husband btw!) 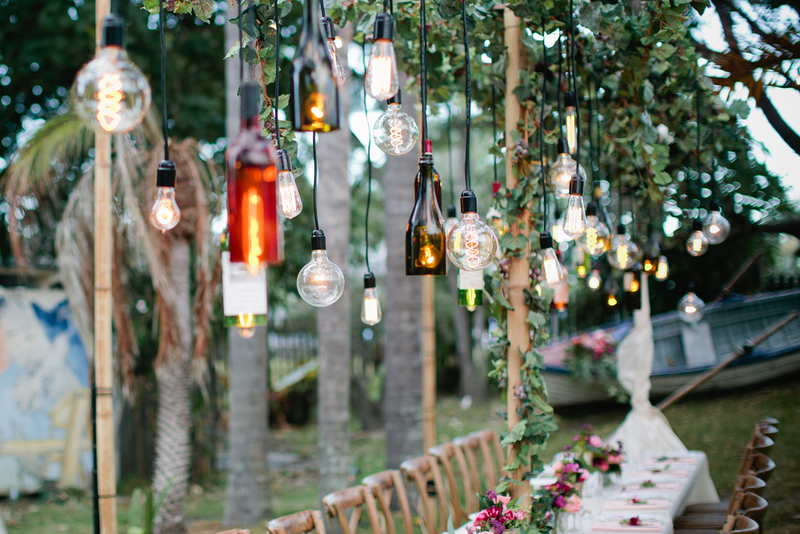 on the job, romantic soft light bulbs were strung and pin spots on the florals made all the difference. Annabelle and Sam had two of these botanical rings as the feature of their reception. Aren't they incredible? We were delighted to hear that Annabelle and Sam's wedding day was everything they wanted and more, (see our testimonials page)... We were truly blown away by Belle and her families loveliness, it was an absolute pleasure working on making the botanical styling perfect to suit this beautiful day. Click here to check it out on Hello May blog. What do you say when you're asked to recreate 'a rainforest' hanging from a tipi ceiling? You say yes, of course! Beautiflora is always up for a challenge and one of our specialities is creating large scale hanging gardens. Do you know how many florists, branches and leaves it takes to create a hanging garden of this size and magnitude? 10,000 leaves for a start. At least. And we're not even exaggerating! 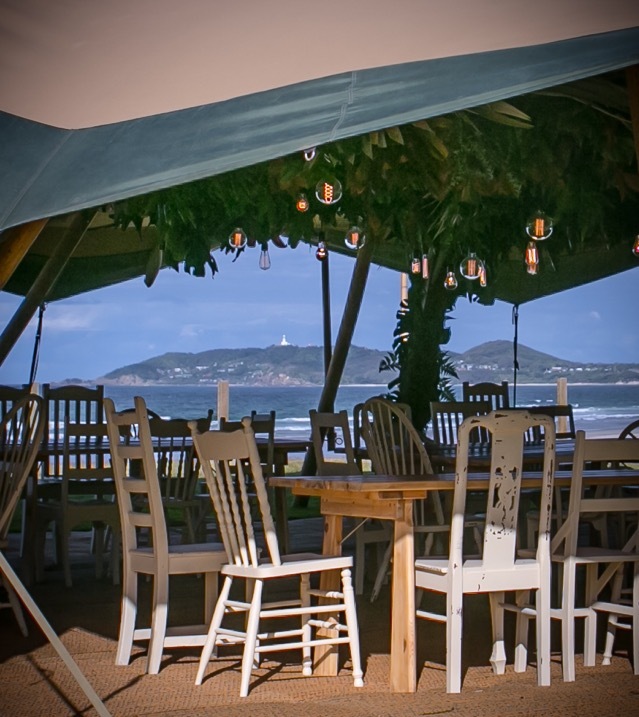 This particular installation was created inside 3 tipis supplied by Samikata Tipi Events at Elements of Byron. The client's brief required different styles of rainforest installations with a continued theme of lush greenery throughout each tipi. Our client wanted their guests to enter into a breathtaking new world as soon as they took their first step into the event. Our entryway achieved this by creating a portal through which people stepped, opening up into their very own "magical botanical world" for the night. The entryway was signified by the ring of gum, moss and ferns in the first tipi, entwined together, delicately draping downward, encapsulating our centred luscious signature green chandelier. Created in collaboration with my husband's company North Coast Events, our stunning living chandelier is all set-off by the simple and elegant glowing pendant globes. As the guests moved from the entryway they then entered the rainforest tipi - the ceiling was filled with a lush variety of foliage detail including giant bromeliads, glorious monstera leaves, clusters of magnolia with hints of tiki fern and more. Again, the pendant globes hung just above the guests' head height- setting off the interiors beautifully. Everywhere they turned, they were met by fresh styled greenery - even the poles were covered in moss and mini monstera leaves. Luscious doesn't even come close! The installation of giant hanging gardens such as these requires careful planning and timing to pull off. It is important to hydrate and keep all the product fresh. It is a laborious and physically strenous job requiring major coordination of staff and allocation of product. Lots of work and we will always be happy and thankful for the privilege of creating wonderlands such as these. beautiflora loves Grace Loves Lace as much as the next bride-to-be and understandably we were very excited to make it onto Grace Loves Lace's radar for their new range photoshoot and look book at The Grove, Byron Bay! This lush shoot also featured in the White Magazine blog early spring 2016. 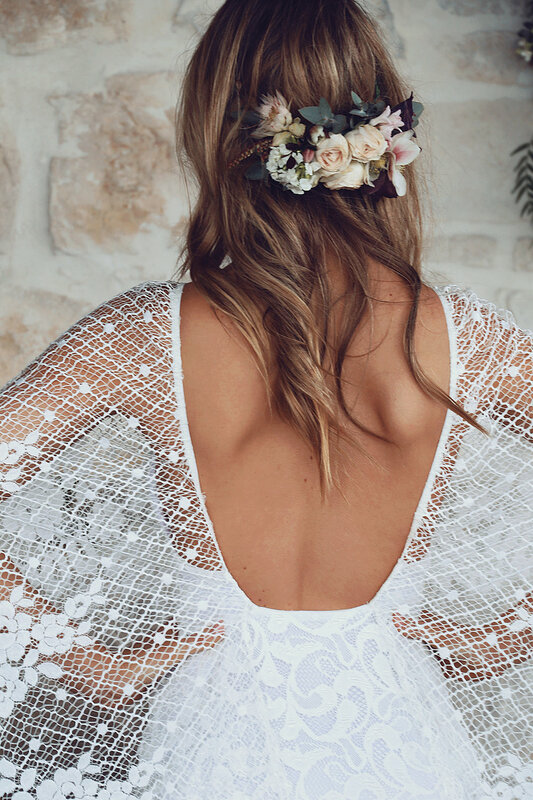 Our aesthetic here at beautiflora is very adapatble from bride-to-bride but we must admit, we are especially experienced in the boho-luxe look and feel which so many of our gorgeous brides embody (how very "Byron" of us!). Photos by @pixpop @burntbreakfast. Bouquet and hairpeice by beautiflora. We invite you to join us for a delightful evening in the flower room at the Newrybar Merchants 120 yr old homestead. Come and enjoy getting creative and making your very own living art piece to take home and admire each day! Tools and materials are supplied including a fun glass of bubbles or refreshing ice tea. The girls will guide you step by step on how to create a unique miniature garden in a gorgeous clear glass vessel, welcoming you to the wonderful world of terrarium making! You will learn all the secrets behind this wonderful botanical art form. A very relaxing craft, with the added bonus that you will enjoy your creation in your home for years to come! Register in the next 7 days and bring a friend to receive a 10% discount. Please book now for the July workshop to secure your space by calling 0421 904 176 / emailing britte@beautiflora.com or visiting the Newrybar Merchants store, across the road from Harvest. This beautiful East meets West styled event was such a delight for us to work on! We've been working together for 15 years but more recently Lhasa has really stepped into her role as our Snr Floral Stylist. We are now working on the botanical styling aspect of our weddings together more than ever before and it's so inspiring! Pratha conveyed to us her gorgeous look and feel and then left the rest up to us, she had full trust in our work and gave us total creative license to meet her brief. The theme was tropical, natural, chatruese limes with whites and creams, lots of texture and interesting shapes using pods, hanging amaranthus, anthuriums, orchids, tropical leaves, berries and only touches of the softer blooms such as open roses. 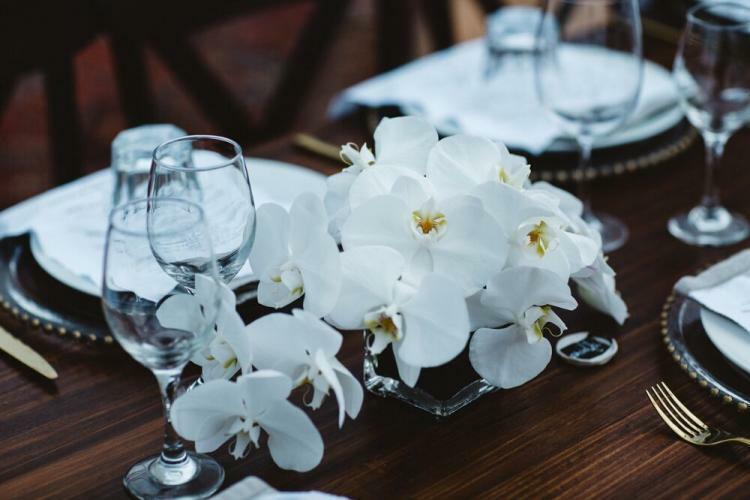 We had loads of fun putting together our buy list which included white hydrangeas, green anthuriums, green amaranthus, star of bethlehem, lotus pods, dried lily pods, white hyacinths, white orchids, privot berries, lime gladiolis, ivy and more. It was our first job in the fantastic new Sperry Tent, and North Coast Events provided these awesome foundation rings to go around the poles for for our floral work, of which you could adjust the height of with ropes. Well we are now well and truly open at Newrybar Merchants! I feel so blessed to have our lovely little florist located there, in the vibrant village of Newrybar. We are situated across the road from Harvest Cafe and Deli, Byron Hinterland's best destination for all things wonderful. We share a space with some other high end designers and creative merchants including Shannon Fricke, Jai Vasicek, Paterson and Steele, Tigmi Trading, Sibella Court, Fate and Fortune, Miller Trading Group and the adorable in house artist, Diana Miller. It's been a challenging yet super inspiring journey opening the store, getting it up on it's feet. The doors opened in October 2015, two weeks after I had a baby, unfortunately for me! The opportunity was now or never. 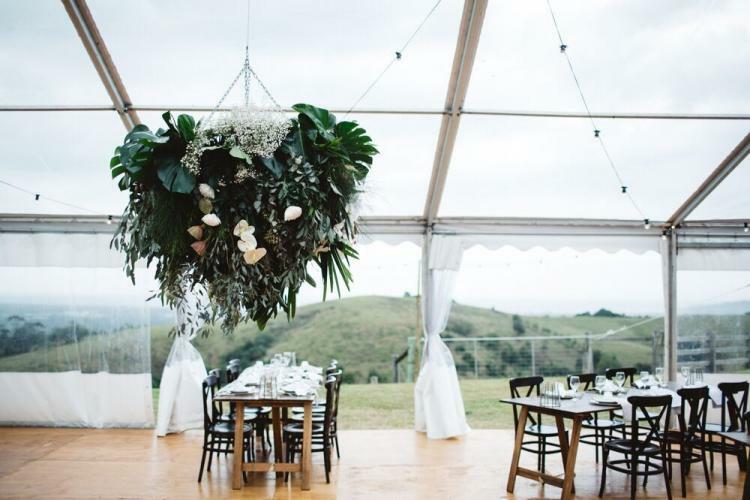 Though I spent many of the past years working at a local Byron Bay florist, from our beginnings in the year 2000, beautiflora had always concentrated on event work from the studio. Then in 2014 we opened the flower cart at Harvest, which naturally blossomed into the new retail space in 2015. I had no idea all this would happen, it was totally to my surprise, and much like the flower cart, it was a vision that sprouted out of nowhere and suddenly became real. I have a new found level of respect for anyone who operates a florist shop. It's no small feat being a small business operator, let alone a florist with a tiny baby to care for, and an eco-system of flowers to manage and maintain at the same time. Running a florist is very labour intensive, keeping all the vessel water fresh at all times, re cutting every single stem to keep the flowers hydrated. The big reshuffle as the new flowers arrive turns our room upside down, with 2 or 3 florists working away during the early hours every couple of days, before the doors even open! Then there's the bouquets to make, clients to meet and of course styling our room so everything sits in it's right spot all fresh, clean and priced, ready for you to walk in and have a sensory experience. I'm grateful to have a beautiful team of talented botanical stylists who make our weddings, events AND 'beautiflora @ Newrybar Merchants' all possible, plus the Newrybar Merchants staff. I'm still trying to find the balance with my new baby and a 3 year old, but again I'm blessed to have Dan (from North Coast Events) as my amazing husband. We somehow keep the boat afloat together. It is a passion, and my gift to the world having the shop space where people can feel inspired. I'm excited to grow with it through the seasons of life, and let it evolve as we do.